Head Xrays are presented here in two views. 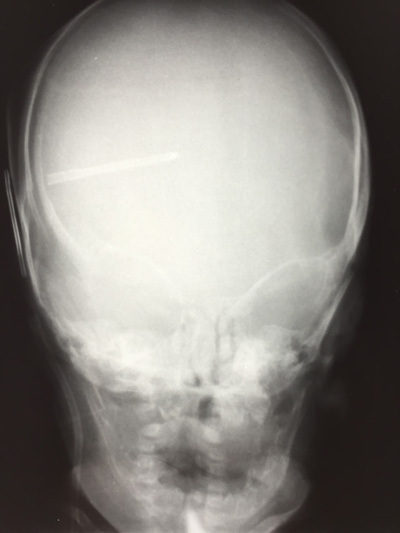 What are X-rays of the Head? X-rays can be a common imaging test for the head that uses small amounts of high-energy electromagnetic radiation to produce images for doctors to view the inside of the body. The level of exposure is considered safe for adults. It is not considered safe for a developing fetus so it is very important that a pregnant patient informs a physician of their pregnancy before having an X-ray taken. Head X-rays pass through skin and soft tissue mostly, but do not pass through bone or metal easily. As different tissues in the body absorb different amounts of radiation, the images will show different shades of black and white. One of the most common uses of a head X-ray is to check for broken bones after an accident, but they are also used under many other circumstances. 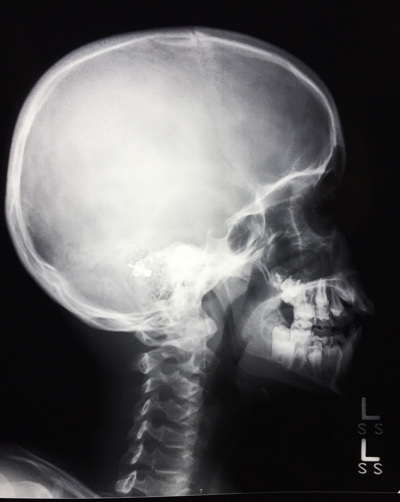 Head X-rays are used to identify, diagnose, and treat many types of medical conditions. It is a key element and often times the first to be done in the diagnosis process. A head X-ray is a picture of the bones surrounding the brain and skull, including the facial bones, the jaw, the nose and the sinuses. It can also include the neck. Head X-rays are used for a multitude of reasons. A physician may order a head X-ray to check for certain cancers in different parts of the head by detecting abnormal tumors, growths or lumps. 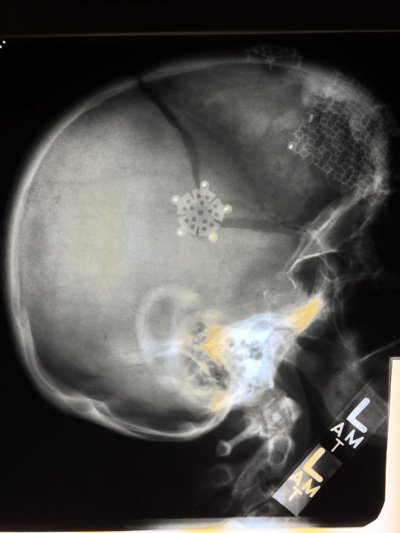 A head X-ray is used to view the area of the body where a patient is experiencing pain, swelling, or other abnormalities that require an internal view. The X-ray can help a physician find a cause for the problems occurring. X-rays can be used to diagnose a disease in the brain or anywhere else in the head, monitor the progression of the disease, determine a treatment plan, and see the effect of a treatment plan. 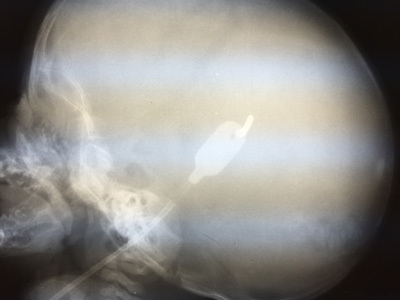 Physicians use X-rays to locate foreign objects within the patient's head. A physician requests an X-ray of the head if a patient has been in an accident that has resulted in injury to the brain, head or skull. 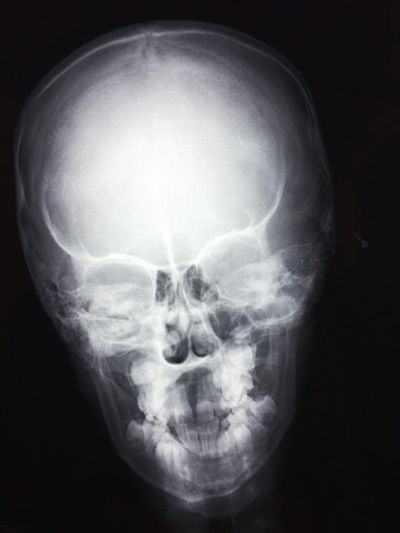 Head X-rays are often used to diagnose signs of structural problems inside of the head including a tumor or bleeding. X-rays of the head can be used to diagnose occupational hearing loss, an ear infection, or abnormal bone growth in the middle ear. An X-ray of the head can also help diagnose a sinus infection, otherwise known as sinusitis. Fractures, calcium loss of the skull, or movement of the soft tissues inside the skull can also be detected by taking an X-ray of the head. ABOVE: Frontal X-Ray of head. ABOVE: X-Ray of head - Lateral View. ABOVE: X-Ray of head - View from below. 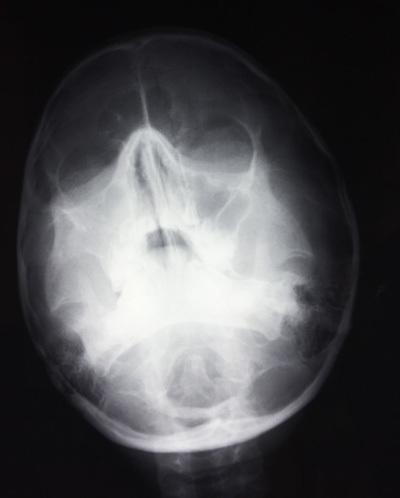 ABOVE: X-Ray of head - Post Craniotomy. ABOVE: Frontal X-Ray of head with ventricular shunt. ABOVE: Lateral X-Ray of head with ventricular shunt.